"Emerging in the early 1970s, RPG zines were hugely influential in the early days of role-playing game fandom and publishing. Inspired by classic titles like Judges Guild and Alarums & Excursions, Kickstarter is inviting creators to launch their own RPG-inspired zine projects in February 2019 as part of Zine Quest, a celebration of these influential documents." 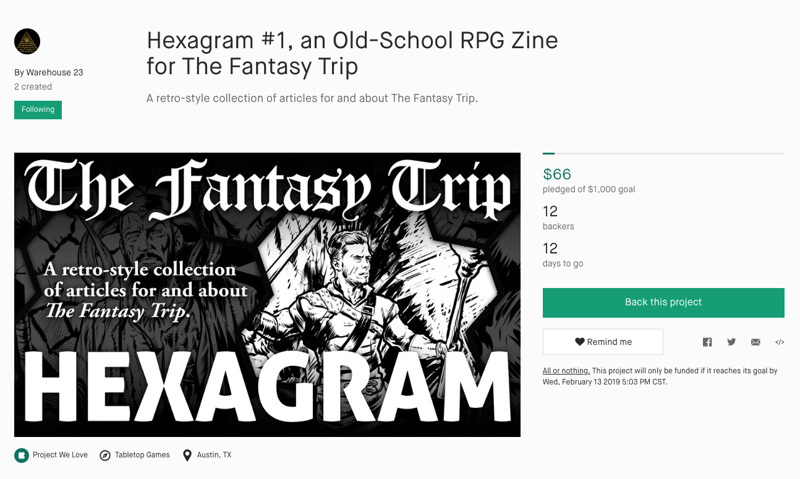 We're happy to announce Hexagram, an old-school zine for The Fantasy Trip and now funding on Kickstarter! The zine is being offered in both PDF and print, so you can get the new content for as little as $3. This is a fun little project and we're hoping that many of you will join in and help us to create a classic-style RPG zine! Hexagram is on Kickstarter until February 13 and, for those of you who missed out on the Legacy Edition or Adventures campaigns, this is your chance to grab those items alongside this new digest-sized zine. Join us!